This article (extracted from the Sunday Times on the 2nd September 2018) must be very worrying for Ford and its dealers in the UK. Having been involved with Ford in the early days of my business life (and my family of course were Ford dealers in Halifax from 1914 through to the early 80s), I am also very concerned for Ford’s future. Makes me realise how worry and stress free my business model is as we are not tied to manufacturers and have no capital risk as we do not require expensive showrooms and forecourts full of used cars! When Ratan Tata offered to pay $2.3bn (£1.15bn at the time) for Jaguar Land Rover in March 2008, Ford’s chairman nearly bit his hand off. “You’re doing us a big favour,” Bill Ford, a scion of the founding family, is said to have told the Indian industrialist. The American car giant was busy shedding non-core brands in an effort to revive its ailing US business. Jaguar Land Rover (JLR) was more of a burden than an asset. Those words have not aged well. Under Tata’s ownership, JLR has gone on to rack up healthy profits and produce a string of popular sport-utility vehicles (SUVs) to widespread acclaim. Another former Ford marque, Aston Martin, last week announced plans to float on the stock market for up to £5bn. By contrast, Europe has become an open sore for Ford. The car maker, based in Dearborn, Michigan, has struggled to make consistent profits from its collection of factories and dealerships. Analysts at Morgan Stanley reckon it has posted a pre-tax loss 12 times since 1999, adding up to a cumulative $3bn (£2.3bn) of losses since then. Ford has persisted with a tired line-up of cars, while only belatedly latching on to the huge popularity of SUVs. This anaemic performance has weighed on its share price, driving it down by more than 40% in the past five years, versus the soaraway sales of its American rivals General Motors and Fiat Chrysler Automobiles. Finally, Ford is promising action. In late July, under-fire boss Jim Hackett postponed a planned capital markets day and warned on profits, blaming its “notably challenged” businesses in Europe and China. Finance director Bob Shanks told investors that its European business required a “major redesign and refocus, particularly given the ongoing effects of Brexit on our most important and profitable market [the UK]”. Ford has yet to flesh out where the axe will fall, but the looming cuts have added to the uncertainty clouding its UK operations, where almost 12,000 are employed across plants and dealerships. These include two engine factories, in Bridgend, south Wales, and Dagenham in east London, which have a total of 3,500 staff. Britain’s imminent exit from the EU has cast a pall, with the risk of tariffs threatening to make them uncompetitive. Analysts at Evercore reckon that 14,000 European jobs could go in Ford’s cull — assuming 60% of the £7bn charges are redundancies. Morgan Stanley analysts predict even more cuts, largely in Europe — about 24,000, 12% of its 202,000 global workforce. Having lost work it previously did for Volvo, and with work for Jaguar also ending, Bridgend risks being closed. “It’s hard to see what set of circumstances would change that,” said an industry insider. “Bridgend is a tough story.” Dagenham makes diesel engines — an endangered business given the fallout from Volkswagen’s emissions scandal. 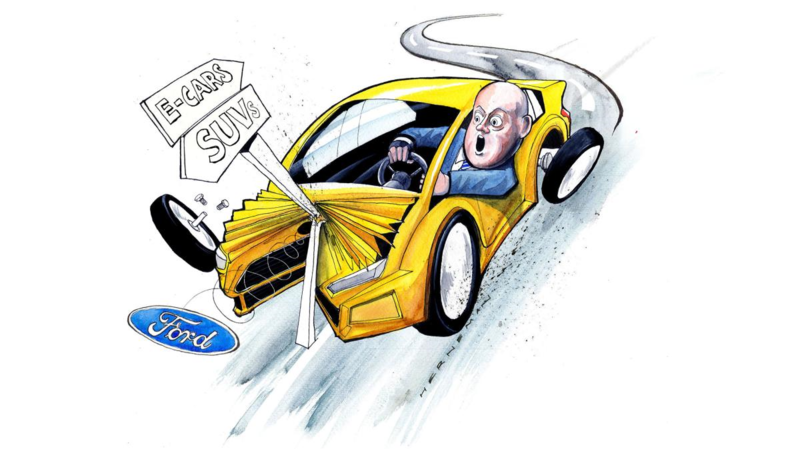 Ford’s slow-motion car crash has been a long time in the making. Under its then chief executive, Alan Mulally, the Blue Oval entered the financial crisis a decade ago in better shape than its US rivals, albeit with a $27bn debt pile at the end of 2007. That allowed it to avoid the fate of GM and Chrysler — Chapter 11 bankruptcy and bailout by the US government. Mulally, a former Boeing executive, had started dismantling Ford’s collection of premium brands by the time the crisis hit, selling luxury brand Aston Martin to a Kuwaiti consortium and Swedish marque Volvo to Geely of China. Selling the upmarket brands allowed it to focus on Mulally’s One Ford plan. Crucially, it helped to ensure the Ford family’s influential shareholding was not wiped out by a rescue cash call, as funding new Jaguar and Aston Martin models would have been a huge drain. Yet survival has come at a cost. Ford has increasingly looked one-dimensional. Sales of its F-150 pick-up in America generate the bulk of its profits. Along with its mid-market peers Vauxhall, Renault and Peugeot, Ford has suffered a sustained assault from German premium car makers in the UK and Europe. Cheap finance deals have put premium marques within reach of households, allowing Mondeo Man to upgrade to a Mercedes. Calling Ford’s cars unpopular might sound strange when the Fiesta and Focus are the first and fourth best-selling new cars with British drivers. But its market share in Europe has been in steady decline. It slipped to 11.3% last year in the UK, while Mercedes, BMW and Audi have all amassed shares of more than 6% each. That’s down from 14.5% a decade ago and 19.2% in 2001. Weak sales undermine the fragile economics of mass market car production, where margins are slender and volumes are critical. It is also burdened with too many showrooms and is believed to be working on a strategy to slash its 464 UK dealerships. Industry insiders also expect it to axe unpopular models — with the Mondeo top of the list. Its biggest problem, however, is cost. Its car factories — principally in Germany and Spain — are believed to be operating well below capacity. Ford has not made cars in Britain since 2002. Some reckon the best option would be for Ford to follow GM’s example and cut Europe adrift, intensifying its focus on America. GM sold the Vauxhall and Opel marques to the French automotive giant PSA for €2.2bn (£2bn) last year. “In our opinion, Ford Europe represents the single-biggest risk to Ford’s long-term financial health and success. A separation — while potentially expensive — may be the best option for Ford Motor Company and Ford Europe stakeholders,” said Morgan Stanley analyst Adam Jonas, who said Ford faced an “existential” crisis. “The segments they are exposed to are in decline. The Ford brand has questionable to minimal value in most of the segments in Europe. They have too many dealers. They have too many nameplates. They have too much capacity. They have too many compliance costs. Then there’s pride. Ford’s relationship with Europe stretches back for more than a century and is imbued with memories of its heyday in the 1960s and 1970s, when Escorts and Cortinas were ubiquitous. What happens next will be grimly fascinating and painful — a foretaste of what faces the mass market car industry. Unions have seen this crunch coming for a long time. Alongside the Welsh government, Unite has been trying to persuade Ford to upgrade Bridgend, where 1,725 staff are employed, to make parts for electric vehicles. Richard Parry-Jones, Ford’s former chief technical officer, is believed to have been lobbying Ford’s bosses in Dearborn on Bridgend’s behalf. “We understand Ford has to make changes, but we see the UK as an ideal partner to continue to develop, design and manufacture both internal combustion and electric propulsion systems of the future based on the excellent labour relations, flexibility and skills we have,” said Des Quinn, Unite national officer. The pressure to build electric vehicles — another area where Ford has lagged the field — and the push for driverless cars leave it at a crossroads, said an industry adviser. Jaguar Land Rover was sold for $2.3bn to the Indian giant Tata in March 2008. After struggling during the financial crisis, the car maker has generated hefty profits through an aggressive roll-out of products, such as its Jaguar F-Pace sports utility vehicle. Profits hit a record £1.6bn in 2016 and it sold 621,000 cars last year, up from about 290,000 in the final year of Ford ownership. Lately, however, it has started to struggle as uncertainty about its diesel engines, Brexit and the tough Chinese market weigh on profits. Aston Martin, James Bond’s favourite marque, was sold to a Kuwaiti consortium headed by motor racing boss David Richards in March 2007 for £479m. Italian private equity firm InvestIndustrial later bought a stake in the company and hired Andy Palmer, the former Nissan No 2, to be chief executive. Palmer has revived Aston by improving manufacturing and launching a range of new models, aiming to create stability after years of famine and feast. It now builds about 6,200 cars a year, compared with 4,200 in 2013. Aston last week said it planned to float on the London Stock Exchange, with an estimated value of about £5bn. Under Ford, Volvo never quite seemed to fit. The Swedish car maker was sold to Chinese firm Geely for $1.8bn in March 2010 — less than a third of what Ford had paid for it. Geely, run by entrepreneur Li Shufu, now values the car maker at $40bn, and is weighing up a stock market float. Volvo sold about 570,000 cars last year, and has expanded into America with a new factory.